Hunt on 3,000 acres of intensely managed deer habits when you plan a trip to the Cedar Knoll Hunting Lodge. For more than 30 years, our lodge has been offering unique hunting opportunities to hunters of all skill level. When you hunt with us, you are getting a chance to hunt without worrying about other hunters surrounding you. We only allow ten hunters at one time on our property, which means you will not have to compete with the general population to get a chance to shoot at some deer. Our business ensures that you will have a successful hunt by only allowing hunting from August 15th to January 1st. This is prime deer hunting time, which has given us a whopping 70% success rate on bucks that are at least two-and-a-half years old and averaging eight points. Our guides will take you to the right spots to help you find and successfully shoot a buck. Are you ready to plan your trip? The Cedar Knoll Hunting Lodge is very popular, offering some of the best guided hunting trips available. Contact us today at (855) 868-5348 or send an email to info@cedarknoll.com for more information about available times. We are confident that you will have a wonderful hunting trip with us! This entry was posted in Uncategorized and tagged best guided hunting trips on May 22, 2018 by 15803827. Why Do We Hunt Deer? Common Game – Whitetail deer are found all over the country and are very popular because of it. It does not matter if you are hunting in South Carolina or are somewhere on the West Coast, you will be able to go deer hunting if you are in the woods. Excellent Meat – When you go hunting, you want to hunt game with the best payoff. Deer are a great option because they are large animals that give more meat than most other common game. Furthermore, this meat is healthier than many other red meats. Fun Opportunities – Hunting deer is excellent because these animals are fun to track and hunt. 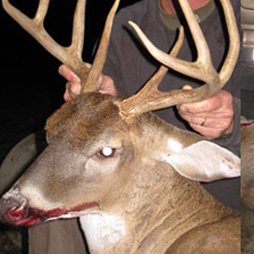 People have been hunting deer for years and we know a lot about their habits. That said, there are still many more things to learn about deer. When you shoot a deer, you have the satisfaction of completing a challenging task. Head out on guided deer hunting trips in South Carolina when you hunt with the Cedar Knoll Hunting Lodge. We offer deer hunting opportunities that are perfect for new hunters, as well as individuals who have been hunting for years. This entry was posted in Uncategorized and tagged Guided Deer Hunting Trips on May 15, 2018 by 15803827. Everyone who goes hunting knows that deer hunting is a lot of fun and a great way for a family to bond. Whether you want to go out with your children or are interested in planning a trip with your parents, starting a yearly deer hunting trip is a great tradition to share with your family. If you are new to the world of deer hunting, you know how exciting this activity can be once you shoot your first deer. Some people grew up hunting, but many people who lived in the suburbs have never gotten an opportunity to go hunting with their family. If you have never been hunting with your family, now is a great time to start. When you hunt, you have a chance to go out into the woods without having to worry about the many trappings of the modern life. Your son or daughter will have a chance to spend some one-on-one time with you, getting to know you and how you operate as a hunter. Additionally, you can take out your brother, father, mother, or grandfather out to hunt, having a similar bonding experience. When you are looking for the best hunting trips in the US, you can rest assured that you will have a fantastic time hunting deer, boar, and quail when you plan a trip to the Cedar Knoll Hunting Lodge. We offer great accommodation and guided trips for beginner hunters, as well as hunters with experience. This entry was posted in Uncategorized and tagged best hunting trips on April 20, 2018 by 15803827. What Kind of Hunting Do You Prefer? Hunting to Shoot – A lot of hunters love to get out in the woods because they want an opportunity to shoot their guns. Shooting at a range can only do so much. If you are going out to shoot, make sure you keep plenty of ammo on hand. Furthermore, you should make sure your shooting at animals instead of your partners. Hunting for a Trophy – There is nothing more glorious than hanging an amazing trophy on your wall. You will always have a great story to tell about the time you shot the prized buck and had him stuffed. When you hunt for a trophy, you are selective about the kind of creature you shoot. Hunting for Sport – Many hunters who like to hunt for sport are experienced hunters who have tried the other hunting styles. When you hunt for sport, you take the time to go out in the woods and enjoy nature. It does not matter what kind of hunting you prefer, the team at the Cedar Knoll Hunting Lodge offers one of the best guided hunting trips on the East Coast. This entry was posted in Uncategorized and tagged best guided hunting trips on April 10, 2018 by 15803827. Are you a hunter who is just sick and tired of heading out, only to find other hunters ruining your experience? If you are new to the world of hunting, this can be especially frustrating, as these others may steal your first kill before you get a chance to raise your gun! The Cedar Knoll Hunting Lodge is proud to present comprehensive guided hunting in South Carolina on private land that is located near the Savannah River in the Lowcountry. Going hunting on private land can change the way you hunt. We offer more than 3,000 acres of intensely managed land that is rich with deer, wild boar, and quail. Our guides will take you out in the morning to prime hunting areas, giving you a chance to shoot without worrying about others ruining your experience. Furthermore, we feature wonderful lodge accommodations that include a dining hall, large game room, a pool table, and central heat and AC for your comfort. If you are looking for something cozier, you can also request a visit to our magnificent executive lodge. Plan your next trip today! Whether you are interested in hunting with your children or are getting together with a couple of buddies, we are confident that you will enjoy our guided hunting packages. This entry was posted in Uncategorized and tagged Hunting in South Carolina on March 23, 2018 by 15803827. “Fred Bear” by Ted Nugent – Everyone needs a good tune to hype them up before they go hunting. Who better than The Nuge to get your blood pumping before you head out? Many hunters have added this selection to their playlist to get them going! “Openin’ Day” by Rhett Akins and Dallas Davidson – If you are looking for a tune that makes you nostalgic for hunting trips of the past, this calm country tune is right for you. “Hunting Girl” by Jethro Tull – Tull is a great way to prep for the hunt. This progressive rock group, known for the classic rock staple “Aqualung,” tells the story about the queen of hunters. “I Won’t Go Huntin’ with You, Jake” by Buck Owens and Buddy Allen – Your hunting playlist does not have to be serious! If you like a good country sing-song before you go out, this classic tune from 1972 is an excellent choice. “Hungry like the Wolf” by Duran Duran – Even hunters like a little pop music! This classic jam has a fast pace and is perfect for those who want something catchy and fun. You can listen to these hunting jams before you head out on guided hunting trips with the team at the Cedar Knoll Hunting Lodge. We offer excellent accommodations and exciting trips for hunters of all skill levels. This entry was posted in Uncategorized and tagged guided hunting trips on March 15, 2018 by 15803827. Take Your Time – When firing a gun, it is essential to be able to shoot when the timing is right. That said, no one starts shooting fast. It is crucial that you take your time and make sure you are shooting with accuracy than speed. Firing too quickly may mean that you miss your target and scare any game in the area away. Practice Dry Firing – Dry firing means working with your gun without any ammo in it. Practicing with your gun gives you a chance to get used to your gun and how it feels as you are using it. Try dry firing at a target and always make sure that there is no ammunition in your gun before practice. Never Push Yourself – Pushing yourself is fine when you are trying to finish a marathon, put pushing yourself with a gun never improves your habit. In fact, you will begin to learn bad habits when you practice shooting while you are tired or just not up to the task. Use your shooting skills when you go hunting in South Carolina with the team at the Cedar Knoll Hunting Lodge. Our lodge provides private guided hunting on private land for deer, boar, and quail. This entry was posted in Uncategorized and tagged Hunting in South Carolina on February 13, 2018 by 15803827. Know the Land – One of the best things you can do is getting familiar with the land before you start hunting. With this knowledge, you will know where deer like to hang out, as well as hiding spots. When you are out on one of our guided trips, you will be hunting with a guide that knows our land like the back of their hand. Walk Slowly – Making noise as you walk through the forest is a mistake that many hunters do not think about until they find themselves rushing to get to their blind. Be mindful of the ground and tread lightly at all times. Mask Your Scent – We have said it before, but it always bears repeating: cover up your scent. Deodorants, shampoos, aftershave, and laundry detergents have strong smells and deer will stay away when they smell them. Experience the best guided hunting trip in South Carolina when you book a trip to the Cedar Knoll Hunting Lodge. We offer deer, boar, and quail hunting trips for you and your hunting buddies on our private land. This entry was posted in Uncategorized and tagged guided hunting trips on February 1, 2018 by 15803827. Always treat a gun like it is loaded. It does not matter if you know the gun is not loaded, handling a gun like it is loaded will create good habits that may prevent some massive issues in the future. Never point your gun at something that you are not ready to shoot. You never know what accidents could happen when you point your gun at something or someone, so you should never do it. Do not put your finger on the trigger unless you are ready to shoot the gucedarn. When you keep your finger off the trigger, you do not have to worry about your gun going off. Know what is behind your intended target. A bullet can easily go through your intended target, so make sure you are not shooting at an animal when a person is right behind it. When you come to the Cedar Knoll Hunting Lodge, we provide you with everything you need on guided hunting trips. Read more about what we have to offer and book a trip today! This entry was posted in Uncategorized and tagged guided hunting trips on January 20, 2018 by 15803827. Being safe while hunting is vital at all times. Before you start a hunting trip, you should do everything you can to make sure that you will have a safe and successful trip. One of the best ways you can stay safe without having to stress or spend extra money is to plan a hunting trip with others. Hunting with at least one other person makes sense for a variety of reasons. When you are hunting with others, your partner – or partners – can be available to assist you with a range of issues. They can assist you with retrieving or loading your game, as well as provide you with first aid help if you get hurt. Additionally, hunting with others decreases the possibility of getting lost while you are out in areas that you may not know very well. At least one of you will be able to the ability to find your way out of the woods. You will never hunt alone with you go on our guided deer hunting trips. The Cedar Knoll Hunting Lodge is proud to offer guided trips in South Carolina for hunters of all skill levels. Book your trip today and have an exciting trip with friends or family members. This entry was posted in Uncategorized and tagged Guided Deer Hunting Trips on January 19, 2018 by 15803827. Copyright © 2019 Cedar Knoll Hunting Lodge. All rights reserved.